The banana spider — Nephila clavipes — is a large, brightly colored species of spider native to the warmer regions of the Americas. The spider is often recognized by its large webs — which often feature zigzag patterns — and its distinctive coloring. It is most commonly found in swampy regions and near the coasts, and is also known by its common name — the golden silk orb weaver spider. In general though, all of the spiders of the genus Nephilia are known as banana spiders, not just Nephila clavipes. 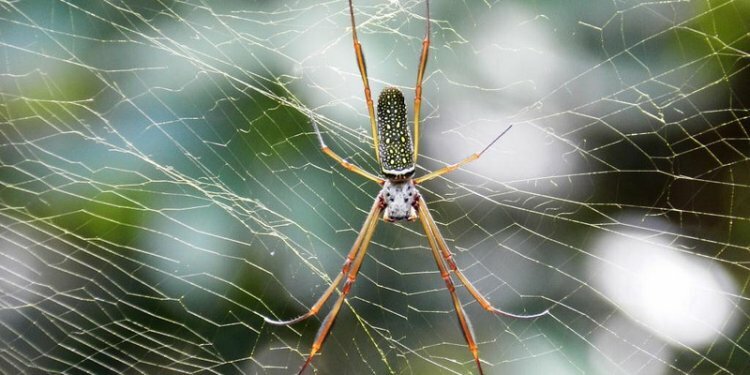 And while in the region that I live in “banana spiders” are all from the genus Nephilia, the name “banana spider” actually refers to a number of different types of spider, depending on the region: the golden silk orb weaver, a type of spider native to the Western Pacific known as Argiope appensa, and also the Brazilian wandering spider. This article will be focused solely on the golden silk orb-weaver though. Female golden silk orb-weavers typically grow to sizes of about (body size, not including legspan) 1.5 – 2 inches. When legs are included, they regularly span more than half a foot. Males are usually around 2/3 smaller than the females. The biggest specimen ever reported on was a 2.7 inch (body size, not including legs) female — though it’s now debated whether that individual may have been from a previously unrecognized subspecies. “The webs of most Nephila spiders are complex, with a fine-meshed orb suspended in a maze of non-sticky barrier webs. As with many weavers of sticky spirals, the orb is renewed regularly if not daily, apparently because the stickiness of the orb declines with age. When weather is good (and no rain has damaged the orb web), subadult and adult Nephila often rebuild only a portion of the web. The spider will remove and consume the portion to be replaced, build new radial elements, then spin the new spirals, ” as Wikipedia notes. With regards to the bite of the animal — it is potent, but it’s nowhere near deadly for humans. The type of poison is similar to that used by black widows, but much less powerful. What you can typically expect from a bite is some redness, discomfort, blisters, and possible swelling — this should all pass within a day or two though. Of course there are those that may possess allergies to the venom, in which case it could be much more dangerous.